The Greater Lehigh Valley Chamber of Commerce-Kamran Afshar survey of the Valley businesses is a quarterly survey that we have been conducting for more than twenty years. According to the July 2017 survey, business sentiment and the overall confidence in the local economy dropped for the 2nd quarter in a row and gave back almost all its January gains and is now statistically back where it was last October. The drop was across the board with the exception of hiring in the last 6 months which rose above its January 2017 level. It is clear that post election enthusiasm among businesses in the Valley has vanished, but it has not been replaced with doom and gloom. Actual payroll employment in the Valley declined by 3,700 jobs (SA) between August of 2016 and August 2017. And this is going in the opposite direction of the national average which added 2.1 million jobs during the last 12 months. By that account we should have gained 5,100 jobs instead of losing 3,700. This is a pretty sizable and unexpected decline. 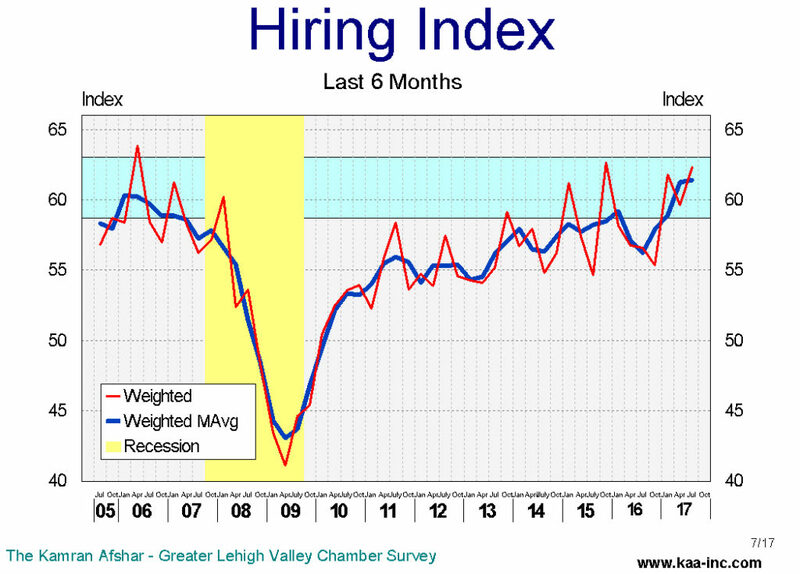 There are other interesting twists and turns in the employment data; The index for actual hiring for the last 6 months rose to 62.3 (seasonally adjusted and weighted, SAW) in July, its highest level in two years, and it is trending inside the expansion zone based on historical data. Also of interest are two other indicators showing the Valley’s labor market as very tight; first, the number of unemployment claims, both initial and continuous are down close to the level of the tightest labor markets in the Valley in the last 30 years. And second is that the July survey which shows current layoffs to be lower than even the ones in 2004-2006 at the height of the economic boom before the recession. The smallest businesses in the Valley, those with less than 6 employees, were the ones who changed their employment structure the least. Three quarters of them did not hire or layoff anybody. This doesn’t mean nothing happened, 22% of them hired new employees while only 3% laid off people during the last 6 months. The largest companies in the Valley, those with more than 100 employees showed the most movement. More than half of them hired new employees, while 14% of them laid off people during the same period. 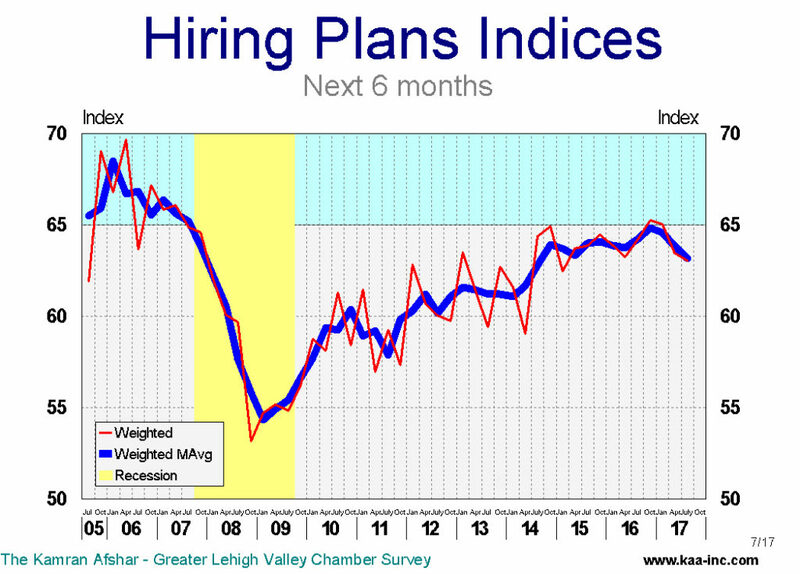 The index of plans for future hiring dropped in July and it is now not only below its January level, but it is even lower than its July 2016 level – the only indicator in the model which fell below its last year’s level. While in April, 8 out of 10 businesses with between 51 and 100 employees were planning to increase employment, in July that number had dropped to 5 out of 10. This is repeated for almost every size category. The index for actual purchasing over the last 6 months dropped more than any other index in the model in July, falling 6% below its April level, and while still above its last October’s level, all its gains since the election have been wiped out. Purchasing plans for the future also recorded a large loss in July, not only giving up all its post election gains, but also, it fell even below its last October’s level. It should, however, be noted that both actual purchases in the last 6 months and purchasing plans for the next 6 months are still in the expansionary range, albeit at the bottom of the range. Percent of businesses participating in the survey which did report an increase in their revenues in the last 6 months rose, but the average increase in their revenues recorded a slight dip compared to April. Business expectation of future revenues after a spike in January and April has dropped back close to where it was last October, and its trend is now slightly downward. In July, the overall business sentiment index dropped for the 2nd time in as many quarters. Local business sentiment gave back almost all of its January gains and is now in a statistical tie with its October 2016 level. The survey of Lehigh Valley businesses shows that their general optimism which surged forward in January is gone and we are almost back to where we were last October. In July expenditure indices as well as the index for expected future revenues dropped significantly. It is very clear that local businesses have lost almost all the enthusiasm they showed in January.